Puppy needs mid day attention! 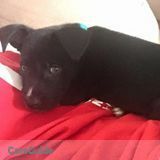 Our 8 week old lab mix puppy, Titan, needs someone to come see him mid day! We have only had him for a week and due to a sudden job change, my boyfriend will not be home to take care of him during the day as planned. We need someone for the next 3 weeks to come over 1-2 times a day to feed Titan lunch, take him outside to go potty, and maybe play with him for a few minutes. These visits can be quick, around 20 minutes and will be 3-4 times a week. The days of the week will most likely not change but it will be discussed beforehand. We live on the Milford/Orange line so someone close by who can pop over mid day would be awesome. We really need someone ASAP so even if you can only do a couple of days, please let me know! Pay will be discussed depending on how many times someone is able to come over, please remember even if you come over twice these visits will be under an hour!